Hair coloring is the practice of changing the color of hair. Common reasons to use hair colors are to cover gray hair, to be more fashionable and to restore the original hair color after it has been discolored by hairdressing processes or sun bleaching. How does hair color work? It is the result of a series of chemical reactions between the molecules in hair, pigments, as well as peroxide and ammonia, if present. The natural Dye molecule for example, henna , its color is obtained from the leaves, but many companies claim the wide range of hair colors of henna are from the roots, bark etc. Skin irritation and allergy: Symptoms can include redness, sores, itching, burning sensation and discomfort. 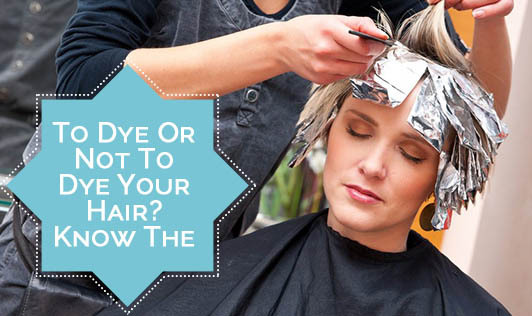 If any of these symptoms occur, alert your hair colorist immediately so that they can remove the color. Hair breakage: This can result in dry, rough and fragile hair. In extreme cases, the hair can be so damaged that it breaks off entirely. Skin discoloration: Skin and fingernails are made of the same type of protein- keratin, as hair. If there are drips, slips and extra hair tint around the hairline, it can result in patches of discolored skin. The Environmental Working Group has little considered on some health hazards as they might contain toxins linked to Cancer, reproduction, immune, neuro and organ toxicity. Always do a patch test, before the entire application. Never use leftover color as it can get oxidized and spoilt. Throw away whatever is left. Color your hair the day after you wash it. This way your hair gets protected by natural oils that cover the hair. Do not blow dry the hair. Identify signs of an allergy-itching or burning of scalp. Immediately wash off the color and consult a dermatologist/ cosmotologist. So, if you are getting your hair colored for the first time, get it done at a good salon by a trained person!